The Tap Project was created in 2007 by the Droga5 ad agency. The main objective of the initiative was to provide children in need with clean and safe water. The angle that the advertising agency took to market this project was to encourage people to donate a dollar to help provide those in dire need the tap water that is given to us for free. There have been multiple campaigns echoing this message since 2007 including World Water Day (& week) and Celebrity Tap. But, it wasn’t until the 2014 Tap Project challenge that UNICEF reached its biggest audience. Their success can be attributed in large part to their active and masterful use of social media marketing tactics. 1.) Get people to donate money to UNICEF in support of one of their mission to provide global access to clean and safe water. 2.) Another objective of the project was to gain brand recognition and awareness to the UNICEF tap project cause. That is the plight of millions of citizens around the world in their pursuit of clean water. 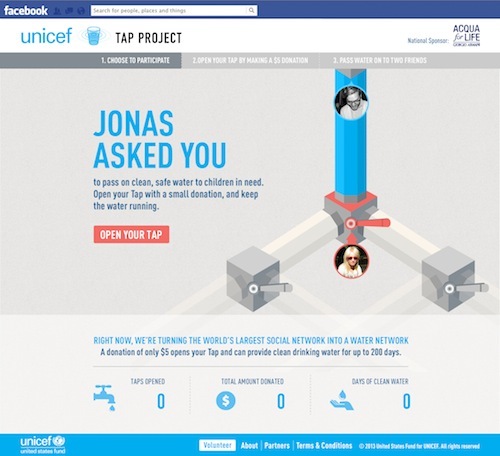 UNICEF and Droga5 employed a full online media blitz to promote their Tap Project campaign and application. The key to the proliferation of their app was the self-promotion feature associated with every tap project. Every person who donates 15 minutes of cell phone time to supply UNICEF with the funding for one child’s water was publicly recognized among their own peers with a tweet sent from their account to each of their followers. This was instrumental in the Tap Project’s success because it made advocates out of supporters. For every person who participated, their activity was advertised to their own group of friends who would see the activity and hopefully pitch in themselves. This tactic was critical to increasing the campaign’s reach and total audience they were exposed to. It also allowed their advertising to be more meaningful because consumers are more likely to trust something if its recommended by someone they know personally. By having all participants tweet out their participation in the Tap Project they were able to have trusted brand advocates all over the globe. The most powerful examples of their trusted brand advocates were celebrities who retweeted the UNICEF handle or even tweeted the results of their own participation in the Tap Project. These celebrities have millions of followers and very devoted fans, so their involvement was very he lpful to the campaign. An example of a celebrity advocate was Selena Gomez. She instagramed a picture of the Tap Project application and her own phone activity, or lack thereof, in support of UNICEF’s water project. By posting this  Selena Gomez became a brand advocate, whether she may know it or not. While there is no way to know if her involvement was of her own free will or if she was paid to promote the initiative but her Instagram of the project and her own participation reached her 40+ million followers. This doesn’t even factor in if any of her fans reposted her picture to their own personal accounts. The large web that social media can tap into was clearly used in full effect by the genius Droga5 advertising minds in the 2014 Tap Project campaign. Strength: This uberly successful integrative campaign taught me the power of good content, given to the right people and places, on social media. This online application could have been easily ignored and lumped into the huge amount of media people consume daily, but the powerful message, capitalization on opinion leaders, and active facilitation of consumer advocacy. The powerful message came from the human insight that average citizens believe that their phone is a necessity. This was then cleverly used by the creative department at Droga5. They were able to juxtapose what people in 1st world countries think they need (cell phones) and what those who are impoverished REALLY need (water). The added even more poignancy and lasting power to the cause as it played off of the original insight into people’s lives. By addressing the privileges we have in our society, it did a much better job putting other people’s shortcomings and suffering into perspective. Weakness: While the campaign expertly built brand awareness and captured consumers attention, I think they could have made a bigger play for personal donations. They really focused on having people donate their time and having their project sponsors foot the bill. I understand that garnering attention for the cause was very important and necessary, but I do think they left some money on the table by not adding a donation factor to the game or making the option more attractive to users.